The pope’s appeal, made in the central Italian town of Assisi where his namesake Saint Francis lived in the 12th century, comes amid a drive by Francis to turn around a church plagued by financial and sexual abuse scandals. Saint Francis is revered by Catholics and many other Christians for his simple values, poverty and love of nature, qualities the Argentinian-born Francis has made the keynote of his papacy since his election in March. It is very true that worldliness fills the vatican. But I want to assure you, Pope Francis, your plagues, which will be the worst ever in your history, have now begun to be the worst. Why? It’s because your sins and iniquity have reached their peak. Sin causes defilement of the bodies of mankind. That defilement has spread into the earth, the waters – salt and fresh – and the firmament; that is, the heavens. The heavens are shown to you, Pope Francis, in the Book of Revelation, speaking directly to you and the vatican, which sits on; that is, judges and teaches the kings of the earth from the seven hills of Rome. Revelation 18:5—For her sins have reached unto heaven, and Yahweh has remembered her iniquities! Revelation 17:18, 9, 3-6—18 And the woman whom you saw, is that great city which reigns over the kings of the earth. 3 So he carried me away in the Spirit into the midst of Godworshipers (worshipers of elohim) (Genesis 3:5); and I saw a woman sitting on a scarlet colored beast, full of names of blasphemy, having seven heads and ten horns. Did you notice? This describes your activities completely – sin, abominations, filthiness from your sodomizing priests, defiling little children and the rest of the world, because the microorganisms – the worst of the Gods – are spreading like the wind, even as I write this letter to you. Your worldliness-deception made you pope of the year; not only that, but you are pope of this present generation – the last generation. In this generation this evil will end, because it’s not of Righteousness, so you will have as you have always had, wars and fighting. The push for power, the man of the hour. Your authority is shown to come from the dragon (Satan). Revelation 13:1-8—1 And I stood upon the sand of the sea, and saw a beast rise up out of the sea, having seven heads and ten horns, and upon his horns ten crowns, and upon his heads the names of blasphemy. All the inhabitants will suffer greatly in this generation. Mattithyah 24:33-34—33 In the same way, when you see all these things, know that His coming and The End of the Ages are near, at the very door. You show that worldliness leads to faulty character. Excerpt from theguardian.com: During visit to Assisi where Saint Francis lived in 12th century, pontiff says worldliness leads to vanity, arrogance and pride. Yes, worldliness does produce spiritually evil characteristics. It also produces many physical defects from defiled microorganisms produced when sin – worldliness – is practiced. This is shown in Yahweh’s Laws of Righteousness. Leviticus 18:3-30—3 After the doings of the land of Egypt where you dwelt, shall you not do; and after the doings of the land of Canaan, where I am bringing you, shall you not do; neither shall you walk in their ordinances. 12 You shall not have sexual relations with your father’s sister;your aunt. She is your father’s near kinswoman. 13 You shall not have sexual relations with your mother’s sister;your aunt. She is your mother’s near kinswoman. 16 You shall not have sexual relations with your brother’s wife;your sister-in-law. She belongs to your brother. 21 You shall not give any of your children to be passed through the fire, to sacrifice them to Molech. You shall not profane the Name of Yahweh by giving your children to gods (elohim). I amYahweh. 23 Neither shall you have sexual relations with any animal anddefile yourself, along with it; neither shall any woman present herself to have sexual relations with an animal. It is confusion and perversion. The word defile, in verses 20, 23, 24, 27, and 30, is referred to in this generation as disease. This generation was spoken of by Yahshua Messiah, Whose Name you replace with the names of two Gods brought from ancient Egypt. Notice Yahshua’s Words showing the severity of your sins in this last generation. Did you notice, Yahweh, Whom you reject, will shorten the destruction to save mankind? Notice the articles showing the start of the fulfillment of this Prophecy. I Samuyl 8:7-8—7 Yahweh answered Samuyl, and said: Listen to all the words the people speak to you, for they have not rejected you; they have rejected Me, that I should not reign over them. 2 Speak to all the congregation of the children of Israyl, and say to them; You shall be Holy, for I, Yahweh, your Heavenly Father am Holy. 3 Every one of you shall honor his mother and his father, and keep My Sabbaths. I am Yahweh your Father. 4 Do not turn to Gods (elohim), nor make for yourselves molten images: I am Yahweh your Father. Remember, making yourself in the image and likeness; that is, character of the Gods, worldliness, making yourself evil like the Gods, is what Satan asks that you do. Genesis 3:1, 5 —1 Now the serpent was more subtle and crafty than any beast of the field which Yahweh had made. And she said to the woman; Has Yahweh indeed said: You shall not eat of every tree of the garden? I Yahchanan 3:4, 7-8, 10—4 Whoever commits sin, transgresses also the Laws; for sin is the transgression of the Laws. 8 He who commits sin is of the devil, for the devil has sinned from the beginning (Genesis 3:1, 5). For this purpose the Son of Yahweh was manifested; that He might destroy the works of the devil. Genesis 3:1, 5—1 Now the serpent was more subtle and crafty than any beast of the field which Yahweh had made. And she said to the woman; Has Yahweh indeed said: You shall not eat of every tree of the garden? Yahshua showed Satan’s work is worldliness, deception and sin, and He exposed it in His Teachings. Yahchanan 15:22-23—22 If I had not come and spoken to them, they would not have had their sins revealed; but now they have no cloak, covering for, their sins. Verse 10 shows that practicing Yahweh’s Righteousness manifests you as a child of Yahweh. Practicing sin, breaking Yahweh’s Laws, makes you in the same character as Satan and the Gods (Genesis 3:1,5), which is worldliness. The Egyptians worshipped all Gods. That’s why their name is catholic, meaning universal. This means they worship all Gods. Yahweh is not a God. Coptic catholics do not worship Yahweh. They reject Yahweh and His Laws, as do all christianity. That’s why they teach that Yahweh’s Laws were done away with. Yahweh and Yahshua did not do away with Yahweh’s Laws. The God worshippers did and still do, even in this last present, prophesied generation. Mattithyah 24:33, 12, 34—33 In the same way, when you see all these things, know that His coming and The End of the Ages are near, at the very door. We are in the prophesied generation of which Yahshua spoke. Mattithyah 24:37—But just as the days of Noah were, so will also be the coming of the Son of Man. All the world at that time worshipped the Gods, except Noah and his family. Genesis 6:5, 11-13—5 Then Yahweh saw that the wickedness of man was great in the earth, and every intent of the thoughts ofman’s heart was only evil, continually. Only eight persons were serving Yahweh at that time. Only eight persons were saved aboard the ark. All the known world at that time was serving the Gods. All the world today worship the Gods except The House of Yahweh. That made them universal, or catholic, just like you, Pope Francis. Their popes/pharaohs were worshipped like your popes in this last generation. This is shown by the Great Prophet of Yahweh, Isayah, whom your Godworshipping fathers persecuted. Isayah 65:1-7—1 I am sought by those who did not ask for Me; I am found by those who did not seek Me. I said: Here I am, here I am, to a nation that was not called with My Name. Isayah 66:17—They who sanctify themselves, and purify themselves in the gardens, following after the priest in the midst of those who eat swine’s flesh, that which is offered to gods (elohim) and the rodent—will be consumed together: says Yahweh. You do know that swine/pig is unclean, right? Trichina from pork gets in the brain and causes confusion, which makes it hard to think Righteousness. 43 You shall not make yourselves abominable with any creature that moves about on the ground. Do not defile yourselves by means of them, nor be made unclean by them. 44 I am Yahweh your Heavenly Father. You shall therefore consecrate and sanctify yourselves, and you shall be Holy; for I am Holy. Neither shall you defile yourselves with any creature that moves about on the ground. 47 You must distinguish between the unclean and the clean—between the animal that may be eaten, and the animal that may not be eaten. You, Pope Francis, claim that the Laws showing the unclean and the clean were done away with by the Savior, but of course, Satan told this same lie to Eve, right? Yahchanan 8:44-47—44 You are of your teacher who is Satan the devil, and whatever she who is your teacher desires, you will do. She was a murderer from the beginning, and remained not in the Truth, because there is no Truth in her. Therefore, when you speak your falsehoods, you speak her words, because she is a liar, and the teacher of all lies! It seems that your sodomites got upset because Phil Robertson quoted I Corinthians 6:9-10. Did you notice that all the sins mentioned by the Apostle Shaul (Paul), he classified as God worship (rendered idolators)? That includes all catholics, not just sodomites. Why didn’t the sodomites notice all the other sins and Gods—Satan and all the Gods of Egypt—mentioned in the following? Do you think they might repent faster if they read II Corinthians 6? II Corinthians 6:14-18—14 Do not be unequally yoked together with unbelievers. For what fellowship has Righteousness with unrighteousness? And what fellowship does light have with darkness? 17 Therefore: Come out from among them and be separate, says Yahweh. Do not touch the uncleanthing, and I will receive you. Leviticus 11:7-8—7 And the pig, although it has a split hoof completely divided, yet it does not chew the cud; it is unclean to you. 2 For you are a Holy People to Yahweh your Father. Yahweh has chosen you to be a people for Himself, a special treasure over all the peoples who are on the face of the earth. But you are the priest that the world is following today; the priest who eats swine’s flesh and celebrates halloween. 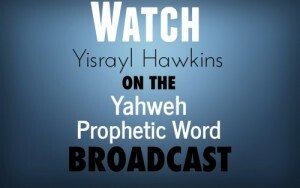 You are not the priest of Yahweh. You are of Satan and the Gods. You eat abominable things (Leviticus 11:3).Abominable means sickness or disease that you pass on to others around you, like the superbugs you are passing on to all the world in this present generation, both physically and through your teachings. II Corinthians 7:1—Therefore, having these promises, beloved, let us cleanse ourselves from all filthiness of the flesh and spirit, perfecting Holiness in the reverence of Yahweh. Did you notice that the Apostle Shaul said to come out from among them? 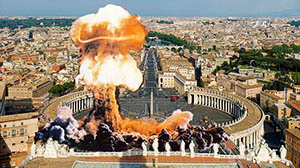 Do you think this means the catholic church will not repent? II Corinthians 6:17—Therefore: Come out from among them and be separate, says Yahweh. Do not touch the unclean thing,and I will receive you. The Apostle Yahchanan, whose name your fathers changed to John, also said to come out from among them. They were speaking of coming out of the city that sits on seven hills, which is the leader of the kings of the earth, bringing forth abominations. And just as you are still doing today in this prophesied last generation. Notice! Revelation 17:18, 9, 3-6, 1-2, 15—18 And the woman whom you saw, is that great city which reigns over the kings of the earth. There are no other cities that sit on seven hills that lead the leaders of the nations. The Basic Everyday Encyclopedia, page 451, gives us the following information concerning these seven mountains (hills). Revelation 17:9, 18—9 And here is the mind which has wisdom: The seven heads are seven mountains on which the woman sits. Through your power and authority, you are holding Yahweh’s People—those who will not bow the knee to lord. If those people were released now, they would come to The House of Yahweh where they would be trained in thePeaceful Solution Character Education Program. This program changes the heart and the mind. It converts the whole person. The Prophet Malakyah was inspired to write that just before the Great Day of Yahweh would come, Yahweh would re-establish a Work to bring one last warning to this world. This Work of Yahweh is to proclaim Yahweh’s Laws and Yahweh’s Prophets, thereby turning the remnant of sons and fathers to Yahweh before The End comes (Mattithyah 24:14 and Yahchanan Mark 13:10). If you let Yahweh’s People go now, we could send them out as teachers in a very short while and stop all curses that we see multiplying in all nations today. If you do not, your sentence is set. 3 So he carried me away in the Spirit into the midst of God worshipers (worshipers of elohim); and I saw a woman sitting on a scarlet colored beast, full of names of blasphe­my, having seven heads and ten horns. Please notice that Yahshua, the High Priest and King over The House of Yahweh, is doing the calling here, and Yahchanan recorded His Words. Revelation 18:1-5—1 And after these things I saw another Malak come down from heaven, having Great Authority; and the earth was enlightened with His Glory. Pope Francis, the calling and those Yahshua will undoubtedly bring out of this abominable system are shown inRevelation 7. They are called by the Two Witnesses. Revelation 7:1-17—1 And after these things I saw four messengers standing on the four corners of the earth, hold­ing the four winds of the earth, so that the wind should not blow on the earth, nor on the sea, nor on any tree. 14 And I said to him: Ruler, you know. And he said to me: These are the ones who come out of the Great Tribulation, who have truly purified themselves by forsaking God (the Gods) and those who worship God(the gods), and who have repented from their murders (bloodshed, war). Revelation 9:18, 20-21—18 By these three were the third part of men killed: by the fire, and by the smoke, and by the brimstone, which issued out of their mouths. You are caught in the middle of this mess. You would be better off to repent, as well as call for the whole seven hills to repent, and let My People go to keep the Feast to Yahweh, as shown in Revelation 7. Revelation 18:8shows that plagues will hit your city. Yahshua shows this time of trouble will be in this generation, that seems to have started with my birth in 1934. This generation is near to end. Yahweh is now calling. Let Yahweh’s People go, Francis, to come to Yahweh’s House. There, they will be trained speedily and sent to teach the Peaceful Solution Character Education Program to all nations, and they will learn war no more. These warnings will not go much longer. With or without you, Yahweh will take His People out of your clutches. Yeremyah 23:5-8—5 Behold, the days come, says Yahweh, that I will raise up a beloved, Righteous Branch, and the Messenger whom I have sent to be My Messenger thus shall succeed, and will execute Judgment and Justice in the earth. 6 In His days, those who reverence Yahweh will be saved and the Called Out Ones will dwell safely; and this is the Name that He will proclaim to them at Abel—Yahweh Tsidqenu: Yahweh our Righteousness. 8 But they will say: As surely as Yahweh lives Who brought up and led the seed of the house of Israyl into the Protected Place at Abel, and from all countries where they had been driven; and they will dwell in their own land. Call me and I will talk with you, peacefully, and answer all your questions about myself. Create bold or italic text. To view the source code, click on the “Source” button above (on the left).